Forced side-scrolling roguelike a remake of Japanese indie game. The next entry in Spike Chunsoft’s long-running Mystery Dungeon series is Fushigi no Chronicle: Furikaerimasen Katsu Madewa (Mystery Chronicle: I Won’t Look Back Until I Win), and it’s coming to PlayStation 4 and PS Vita in Japan this spring, the latest issue of Famitsu reveals. As with previous entries in the Mystery Dungeon series, the in-game areas that players explore remain randomly generated. However, with every turn that passes, the screen forcibly scrolls as the world gets slowly swallowed up by a mysterious light, leading Spike Chunsoft to officially classify the game as a “forced scrolling RPG.” Players are able to name their worlds, which is then used by the game to generate its random layout. Should players then go online and play in the same world, they can compare their progress to those of other players who have played in the same world by inputting the same name. Though specific gameplay details beyond that remain unknown as of this writing, those who are knowledgeable about the Japanese indie game scene might find much of this basic concept to resemble that of the PC game One Way Heroics. This is entirely by design. 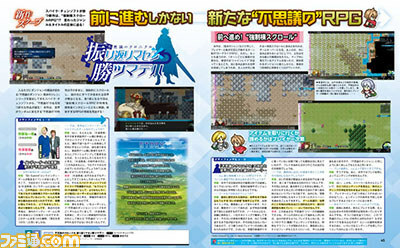 In an excerpt of an interview that’s running in this week’s issue of magazine, producers Yuichiro Saito and Yoshinori Terasawa describe Fushigi no Chronicle as a remake of sorts, albeit one that puts their on spins on the core design.